All other text is wrong. Basic prompt, games like Ultima IV. I removed all expansion cards just in case and same problem. Any ideas whats wrong?? I rung a system test and things look fine except I get no "SYSTEM OK" I get "IEPLEL MI"
Is there s chip that controls text output or a jumper? Well, a few things.. check that the chip numbers and speeds are correct, like the video & character generator rom. Check that all the pins on the chips are spit polished silver. Move some ram around and see if the problem changes. Get the basics done first, then we can get down to business. These days when I get some classic hardware I'm always prepared to buy two or three of the same item for spare parts. Between them I'm always able to get a 100% working unit going. Here are some examples of the incorrect text. As you can see the graphics are broken too. Looks like something is wrong. I've just noticed the Apple IIe has a German keyboard layout. So it looks like a European version. Thanks for the reply. Quick confirmation before I start troubleshooting. Is the video display correct? e.g. 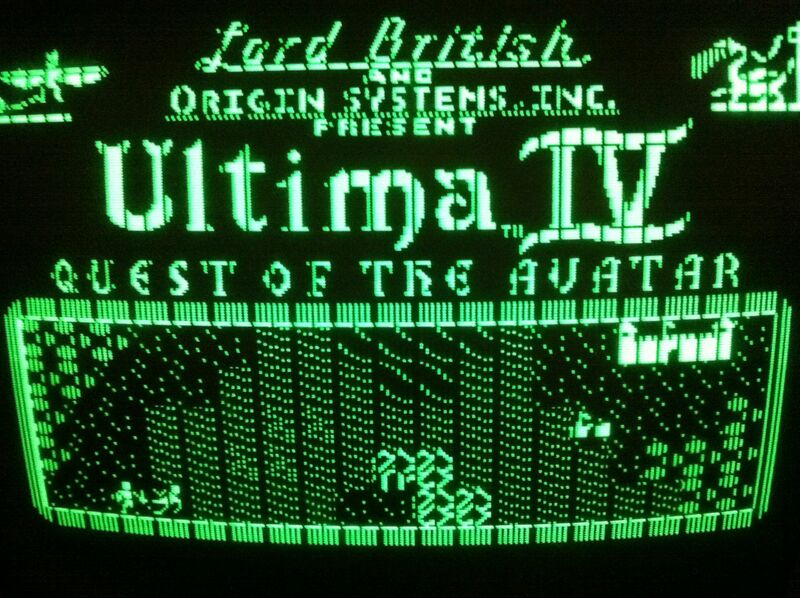 : The graphics of ultima displayed split lines etc. Is this normal? Obviously the text characters not appear correctly is a problem. Ok, I've removed and cleaned all RAM chips and re-seated them so they are nice and secure. I've removed, cleaned and reseated the Video ROM and Keyboard ROM AY3600-PRO. Still same problems. I've managed to locate the colour monochrome switch onboard and now have the Apple IIe in colour. Do you suspect the keyboard ROM is bad then? I have a switch between German and English on the bottom of the case and when flipped the text appears a little better but still not correct. So if the RAM, Keyboard chip and possible video rom is faulty is there any replacements out on the net? e.g. shops selling the chips. Or are they not made these days? I think RAM for bit 1 and 4 have gone bad. Your unit is probably unenhanced, and it was trying to display KERNEL OK when you did the three fingers solute. Great stuff. The Apple came with a 64KB RAM card. 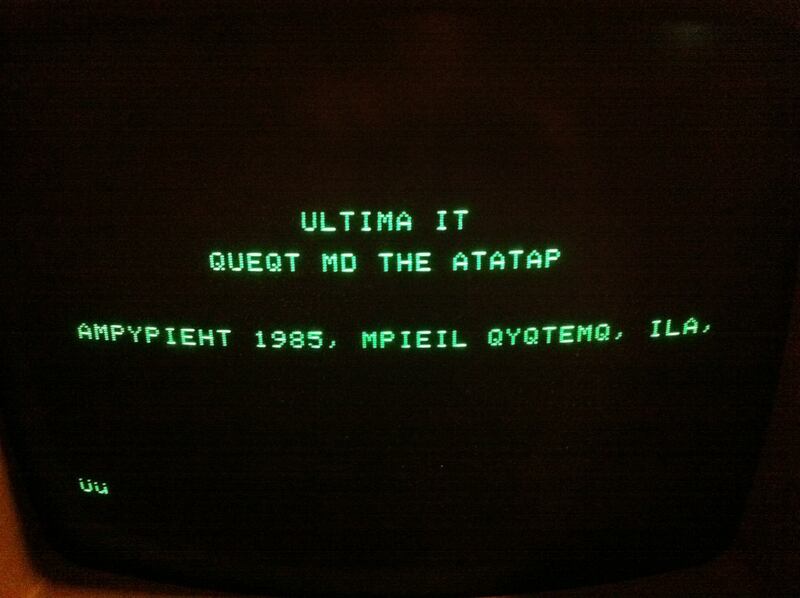 How can I confirm its got the 4164 chips? I will try swapping out tonight. Also when testing the chips do I need to follow any order or just start from one side and work my way through the 8 chips as you say above. 4,2,1. With regards to the character problem. I've located the switch for the keyboard English to German. When flipped the English version displays the correct Basic prompt [ and at boot up displays Apple ]Y. So it seems better than the german version. So could this be RAM related too? Or does it point to a faulty Character ROM? Can these be purchased? 4164-3 has a timing of 300 nanoseconds -i.e. is "slower"
Much appreciated SpeedyG. I'll report back tonight once I've done the above. ok, I went through all the RAM bank with the RAM from my 64kb card. Still the same. 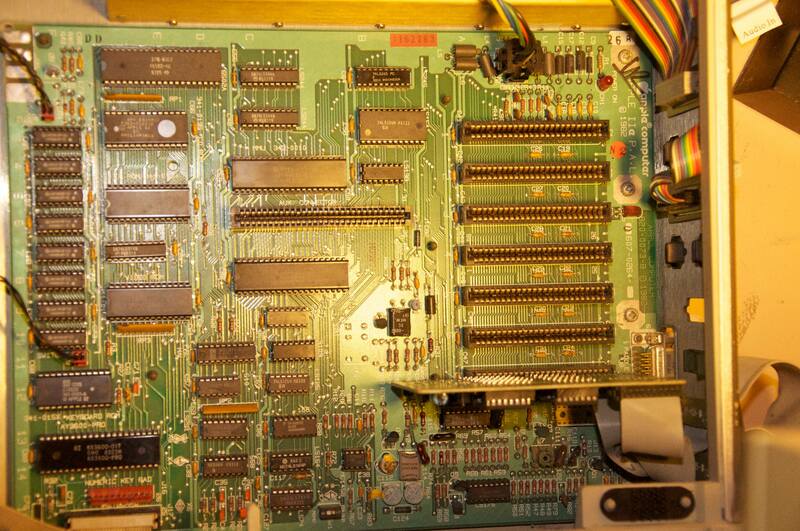 I cleaned and reseated the MMUn 343-0010 chip too. All chips are pristine clean and correctly seated. I've triple checked them just in case. Thanks for all your help. I've removed and clean all chips on the board just in case. Same problem. I've located the 74LS244 chips but don't have any replacements to try. My Expansion board does not have these chips. If I can get hold of a oscilloscope can these chips/roms be tested? I've found the exact same problem here on a French site. I used google translator to translate it as I don't speak French. They say the following: the cause could be the video ROM or Input / Output Unit (IOU 344-0022). 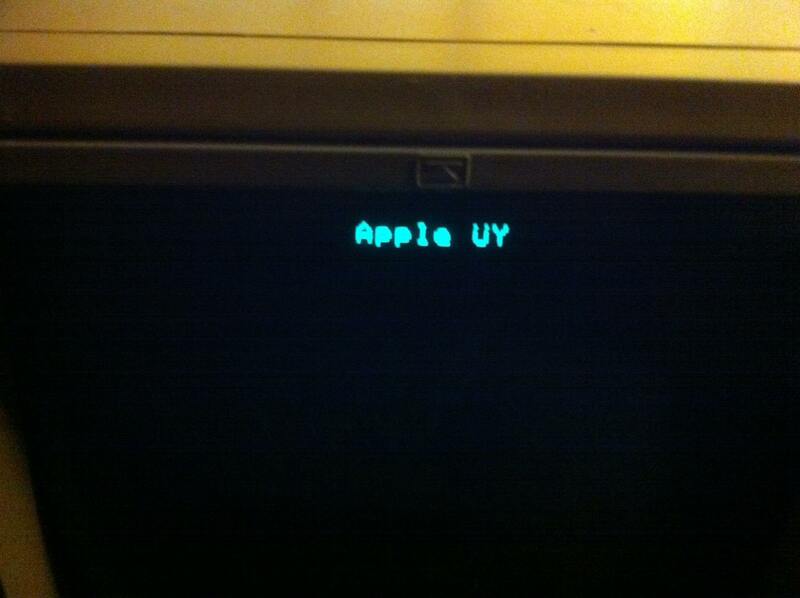 My Apple IIe PAL does not have the IOU 344-0022 its got the IOU-343-0022. Could be a typo?? So can the chips/Roms that don't have APPLE on them be found or purchased? Are they still made?? or the wrong mapping of the char-gen-chip. which also decides if the use of the Memory or the ROMs or the Slots are used. The 74LS244 are responsible to switch and buffer the adressing-lines. and they decide if the adress is coming from the CPU or from a SLOT or from one of the custom-chips ( IOU or MMU ). As a French guy, I can told you the problem was solved by replacing the Video ROM chip (341-016x). So the question for 1 million dollars. Is it possbile buy the Video ROM chip? Or would I need to source it from another Apple IIE PAL motherboard? Would any of these rome help me? Or are they only for the USA model? and as I explained in the last posting i will send a list of permitted combinations and the adresses for the files needed to burn the EPROMS. that post will come when i finished my other tasks today because i first have to finish those things that are limited by "deadlines" like they are set from court to pass over a statement ... that has for sure priority and has to be finished first ! Then i will search my archive as explained... O.K. ? ROMs without country code are used in both languages ! the keyboard ROMs might be replaced by 2716 EPROMs. so if you have a friend who is capable of programming EPROMs he might help you to make the fitting EPROMs. and it is not permitted to mix US-only or US-UK versions with US-DE versions. your point only probably solves the wrong display of the characters... it does not solve the dark-lines in the graphics page ! Just to recap as I'm getting a little lost here. I understand I have two problems and will start an attack plan to try and resolve the issues. 1. The dark vertical lines on the video graphics. 1st problem. From what your saying this could be memory related issue, the MMU rom or the video rom. The French forums guys had the same problem and it was resolved by replacing the video Rom. As I've tested the ram and no errors the problem could lie in the video rom. Your saying that this rom can be purchased as: 2716 and then programed with your .bin file. Maybe this should be our first step to test the theory? 2nd problem. From what your saying its the character gen rom. The AY3600-PRO rom. This can be purchased 2716 and programed with your .bin file. Meanwhile I'm hunting down another german Apple IIe for spare parts. second the wrong characters are probably related to VIDEO ROM and that is 2764 EPROM and they are in the list as VIDEO ROM. The Character ROM might be a Problem but that is not sure at the moment. that not US-Versions are mixed with German versions). and check that the IOU has correct Apple ID Number because that is dependent to NTSC or PAL version ! So it looks like a mix of chips and a few that are not on your list? That looks correct for a IIe in the unenhanced version with US-DE ROMs. The IOU and the MMU are the correct versions for the european IIe in the PAL-version. The CD-ROM and the EF-Rom are the correct versions for the unenhanced IIe and these ROMs are not language specific. The Video-ROM and the Character ROM are the correct ones for the unenhanced for the German Market ( they are language specific and both have the German Character-set in side as US - DE because both contain the DE in their coding - so thats correct. This brings us up back to the point that i explained- that either the MMU or the IOU has malfunction and my first try would be to change the MMU ( if you get one with the same codes as explained above and certified by you ). The second try would be to swap the IOU. ok great. So can you confirm both these roms can be replaced by the 2764 EPROM? I then need to locate someone to program them with the files you indicate above right? The MMU and the IOU are CUSTOM-CHIPS ! They can´t be replaced with EPROMs ! This was explained in my previous posting #13 ! the possibility to replace is only given for the ROMs and not for the custom Chip´s ! this is also the reason that in my listing behind the coding NO EPROM TYP was added ! I wonder if we are not looking at a 16R8 HAL issue or its connections to the IOU, not to mention the IOU itself. An easy test could be swapping the LS374 video latch too. If the Hal would be the problem, the mistake would display in another form: there would be trouble with the colorsignal ( see reply #6 ) in the graphic pages displayed in the pictures above.... i asume that you have taken a close look to those pictures ... did you ? and if the IOU would be the cause of the trouble the mistake would also differ from the stated and examined points... several tests have been solved already in earlier posts.... have you read the entire thread ? I managed to secure a cheap second Apple IIe from ebay. First thing replaced was the Video Rom to see if that was the problem. The problem has been resolved. Looks like the ROM was faulty. Thanks for all your help. I've got another problem but I will open a new thread.